A sculpture believed to be of King Haakon V Magnusson as Duke of Oslo, Oppland, Ryfylke, the Faroe Islands, and Shetland. 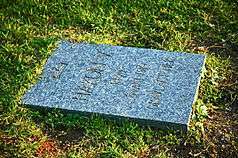 Burial site of Haakon V Magnusson in Oslo. The House of Sverre (Norwegian: Sverreætten) was a royal house or dynasty which ruled, at various times in history, the Kingdom of Norway, hereunder the kingdom's realms, and the Kingdom of Scotland. The house was founded with King Sverre Sigurdsson. It provided the rulers of Norway from 1184 to 1319. The house was founded with King Sverre Sigurdsson, who claimed to be an illegitimate son of King Sigurd Munn, when he was made King of Norway. After Sverre's death, his descendants would expand the influence, wealth, and power of the dynasty. Under his grandson Haakon IV's rule, medieval Norway reached its peak. Also Margaret, Maid of Norway was a member of this family. The house replaced the Gille dynasty, and was again replaced by the House of Bjelbo, which inherited Norway's throne. They were the last reigning family that claimed patrilineal descent from Harald Fairhair. The main arms of the kings belonging to the House of Sverre, was a golden crowned lion on a red field. The lion was later supplied with a silver axe symbolising Olaf the Holy. This became the coat of arms of Norway. Seal of King Haakon V Magnusson, the last king belonging to the House of Sverre. 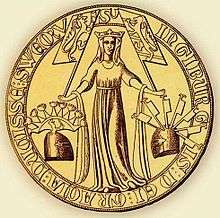 Seal of King Haakon V Magnusson's daughter, Duchess Ingeborg. Arms of King Haakon V Magnusson's daughter's son, King Haakon VI Magnusson, who was of the House of Bjelbo. His coat of arms includes the Sverre arms and the Bjelbo arms. ↑ Lunden, Kåre; Mykland, Knut (1976). Norge under Sverreætten 1177-1319. Norges historie. 3. Cappelen. ISBN 9788202034535.